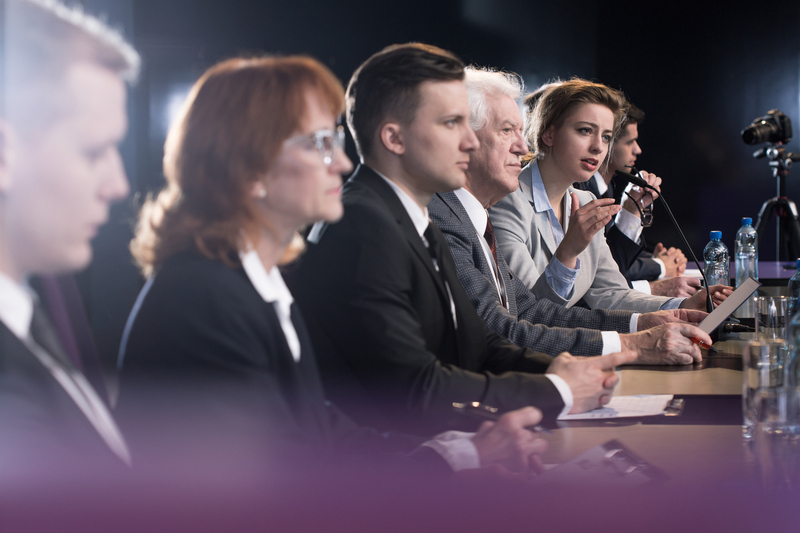 Advancement professionals are often asked to make presentations or represent university leadership at formal meetings such as those conducted by the school’s board of trustees, alumni or foundation boards, community non-profit organizations, or local government. Presenting yourself and your school with polished meeting manners goes a long way toward establishing credibility. Here’s how to project a professional image when you are attending a meeting. Arrive on time in business attire (suits for both men and women), prepared for the topics to be discussed. Review any background materials, including minutes of the previous meeting, that were distributed in advance. 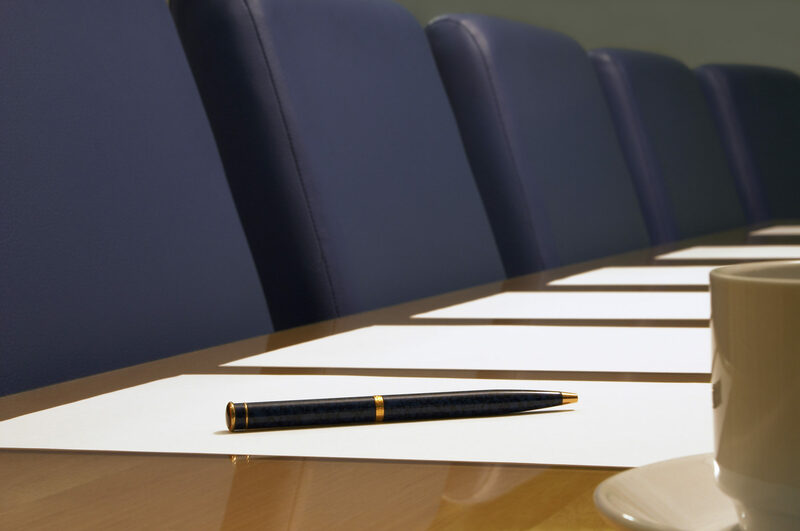 Familiarize yourself with the names of board members. If you are making remarks or giving a presentation, plan and rehearse what you will say. Have your papers and relevant materials neatly organized in a folio so you don’t have to dig for them. It is considerate to give your business card to the meeting secretary so that your name and title can be accurately recorded in the minutes. If you are a guest or newcomer to the group, make your presence known by introducing yourself to the meeting chairperson or planner. He or she should indicate where you are to sit. If not, ask before taking a seat. Place your computer bag, tote, or purse on the floor beside your chair (never on the meeting table). Silence your cell phone and put it out of sight. Peruse the agenda so that you know when it will be your turn to speak. Introduce yourself to others and make light conversation with the people seated beside you until the meeting begins. Don’t arrive with a to-go cup of coffee, water bottle, or food in hand. Doing so lacks polish and hints that you don’t trust your host to offer refreshments. If you are making a presentation that requires audio visual equipment, arrive early so that you have time to test it. Avoid computer compatibility problems by bringing your own laptop, connector cables, and your own remote. Always have a copy of your show on a thumb drive not only as a backup, but so that it can be given to the AV techs in the event all shows are being run from a house computer. Test all Internet or Wi-Fi connections if they are essential to your show. Remember that your computer may have to be signed-on to a secure network in advance. When it is your turn to speak, take your tablet, laptop, or notes to the podium. If you’re using written notes, carry them in an attractive portfolio. Don’t place them on the podium in advance because other speakers may need room to spread out their things and you run the risk of them being accidentally being picked up by another speaker when he or she leaves the lectern. Respect others by confining your remarks to the amount of time you have been assigned. During the meeting, keep attention focused on the purpose at hand by refraining from texting, checking e-mail, or doodling. If no refreshments are offered, don’t ask for them. When beverages are served in cans, pour the contents into a glass before drinking. Keep your seat during the meeting and keep your place at the meeting table free from litter. Place dirty cups and trash on a side table (if one has been provided) during an appropriate break in the proceedings. Don’t interrupt others or comment on everything that is said. Organize your thoughts before speaking. If you disagree with something that has been said, do so politely and avoid credibility-damaging outbursts of anger. When the meeting ends, thank the chairperson before you leave. Follow up promptly on promises or assignments. Much of a meeting’s effectiveness boils down to manners (or lack of them). A well-managed meeting increases productivity and runs smoothly, largely because the meeting’s chairperson and participants know their roles. Here are some tips for chairing a meeting. The first step toward meeting success is having a clear purpose and knowing what you want to accomplish. Define the meeting’s objective, and then determine who needs to attend to accomplish it. Invite only the people necessary to fulfill the task. Not only will a smaller group speed things along, people appreciate not having their time occupied unnecessarily. Schedule the meeting for early in the day, so people can stop on their way to work. This strategy lets you harness participants’ creativity while they are fresh and energetic and helps ensure attendance because you catch people before they get bogged down in problems at their own offices. Set an agenda and distribute it beforehand via e-mail. Include background information that will help make the time spent together more productive. Select and prepare the meeting room for maximum comfort. A room that is brightly lit and cool will help keep people from becoming drowsy. Check the room arrangement by actually sitting in different locations to be certain everyone can see and hear. Cue computer slides, videos, test Wi-Fi connections, and conference-calling gear. Know what to do if equipment malfunctions or, if you are in a hotel or conference facility, how to contact the on-call AV specialist. Practice dimming and turning on lights. Thoroughly test sound equipment, including all microphones, and adjust volume levels. Tape electrical cords (especially those around the podium) to the floor for safety. Offer beverages such as water, sodas, coffee, and tea. Other refreshments are not necessary unless the meeting will be long or encompass a meal time. It is the chairperson’s responsibility to introduce people to each other and to tell them where to sit. If your meeting is formal or will involve unfamiliar people, prepare each person a name plate that can be read by others in the room. Assigning seats also gives you the opportunity to strategically seat people together or to tactfully keep adversaries separated. Remember that the second most important person present should be seated on the chairperson’s right. Begin on time, and don’t interrupt progress by stopping the proceedings to fill-in latecomers. Instead, keep the meeting moving, and bring those who are tardy up-to-date after adjournment. Don’t allow phone calls or interruptions, and politely request that cell phones be silenced. Set the tone and establish control by delivering a crisp welcome and very brief overview. Stick to the agenda, and guide conversation to keep things moving on track. Limit circuitous discussion and disagreements and don’t let the meeting disintegrate into bickering or aimless rambling. Settle differences by taking a vote, or if an issue cannot be resolved, assign the subject to a sub-committee for further study. As chairperson, see to it that people speak in turn and that everyone has a chance to contribute. Call on quiet people to encourage their participation, and tactfully cut off a windy person’s lengthy remarks, especially when they are inappropriate or off-subject. Take minutes, and distribute them via e-mail before the next meeting. Minutes serve as a reminder of who promised to do what by when.